Chelsea has been wandering the woods of Middle Earth since she was 15, and never really left. Her deep and all-consuming love of Tolkien, and lifelong bookworm habit, has introduced her to many other corners of geekdom, but she’s never strayed too far from the Misty Mountains. Chelsea has a bit of an itinerant nature, and can never go too long without planning a fantastic adventure – on which her obliging partner and wonderful friends are usually game to tag along. Her travels have taken her as far as South Africa, Scotland, and Japan – and her hope is that a New Zealand trip is not too far in the future. Chelsea is delighted to be a founding officer of the GeekGirlBrunch Detroit chapter, an employee of a Metro Detroit human services nonprofit, and is also honored to be the event chair of ComiqueCon: Celebrating Women in Comics. She can usually be found by a tree, with a book. Sharon comes from a long line of noble geeks. Her grandfather’s favorite tv show was Star Trek TOS. She has many fond memories of watching the Highlander TV show with her mother. Her own geeky streak came into full bloom when she discovered Sailor Moon as a young girl and started covering all her papers with drawings of Sailor Scouts. These days she’s an electrician by day and a champion of feminine geekery by night. She’s very proud of her work on the con committee for ComiqueCon and also of her cat, Max Rockacatsky. After a childhood full of cartoons, Sunday funnies, and Sergio Aragonés books it is no surprise that when Katie landed a job at a comic book shop she would never leave. Joining forces with her husband, who has been a lifelong fan, their passion for comics spawned Green Brain Comics, Detroit’s premier spot for comic readers. Katie also has been known to geek out over maps, math, science, nature, sustainability, gardening, cooking, healthy eating, and more maps. 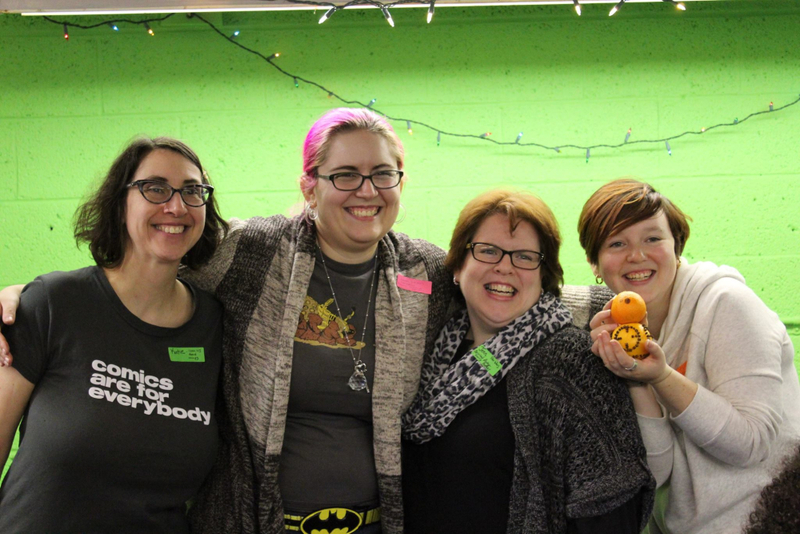 Being an officer for Geek Girl Brunch Detroit was a no-brainer for Katie, who has been an active proponent of getting more women involved and supported in comics, especially in creating a safe and welcoming environment for fans to shop. Jenn Chisholm is an art teacher who took time off from her career to focus on her family. She became… Super Mom with her toddler sidekick ( his super powers are cuteness and slobbery kisses ). Jenn hopes that her love of Harry Potter, Star Wars and general silliness will supersede the power of Thomas the Tank Engine in her son’s life. When not singing “wheels on the bus” she spends her time creating her own art, reading, and devising new ways to rearrange and decorate her house.